Reports issued by consultants tend to be diplomatic documents. One has to use genteel language when criticizing the people who hired you in the first place. 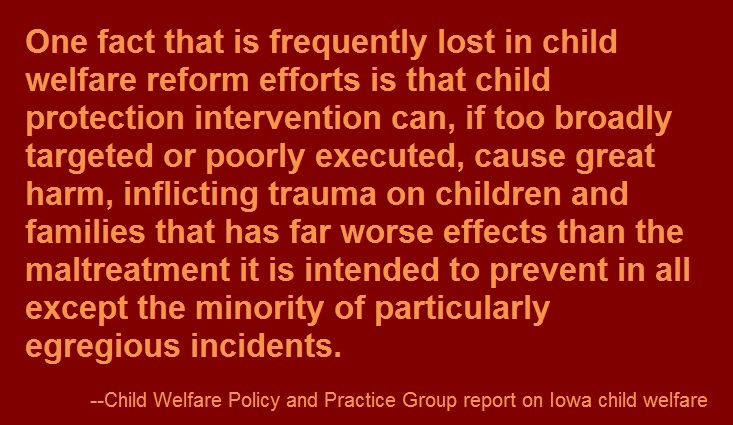 Nevertheless, there’s no mistaking the message from a recent report by the highly respected Child Welfare Policy and Practice Group concerning child welfare in Iowa. The report found that recent policy changes made by the state Department of Human Services in the wake of high-profile tragedies have made things worse. And things weren’t good to begin with. Iowa has long been an extreme outlier, tearing apart families at one of the highest rates in America. Then, over a little more than a year, four high-profile cases of vicious, sometimes fatal abuse of children “known to the system” made headlines. Given that, in every one of these cases, the alleged perpetrators were foster parents who had adopted the children they allegedly abused, one might think this might finally lead to reforms aimed at curbing needless removal. But that underestimates the capacity of child welfare systems – and often, sadly, the press and the public -- for double standards. Had there been four separate cases of horrific abuse by birth parents making the front page of newspapers in a relatively small state day after day we all know that everyone would be scapegoating efforts to keep families together and demanding that we take away more children. But DHS has done nothing to curb needless removal. On the contrary, even though the abuse occurred in foster care, DHS has made changes that actually increase the likelihood that even more children will be funneled into the very system where these children were tortured. Sadly that is not unusual. As I first noted long ago, foster-care panics – huge spikes in removals of children from their homes in the wake of horror stories – almost never work in reverse. Again the response is unsurprising. 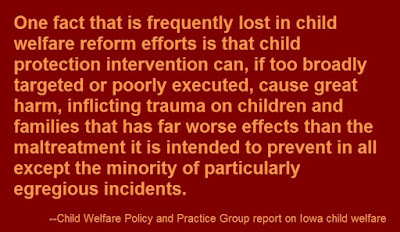 When the first of the horror story cases made headlines, supporters of Iowa’s take-the-child-and-run approach rushed to scapegoat differential response -even though there was no evidence that the case in question ever involved the use of differential response. The result of all this is a 43 percent increase in the number of families subjected to a child abuse investigation in Iowa. These policy measures, the broadening of intake and the lowering of screen‐out rates, are familiar; they follow a pattern often taken by states in the wake of child fatalities or other high profile cases in well intentioned attempts to ensure children’s safety. They have, however, in the reviewers’ experience, seldom if ever had the intended effect. Such actions can, in fact, serve to place more children at risk by adding to workload requirements that are frequently already overwhelming and broadening the scope of intervention far beyond the expertise or experience of child welfare personnel. One fact that is frequently lost in child welfare reform efforts is that child protection intervention can, if too broadly targeted or poorly executed, cause great harm, inflicting trauma on children and families that has far worse effects than the maltreatment it is intended to prevent in all except the minority of particularly egregious incidents. That was only the beginning. As I read the report, a theme emerging over and over is that almost everything that exists to help families and children on paper in Iowa doesn’t function that way in real life. ● On paper, Iowa embraces the concept of family team meetings, in which everyone important in a child’s life gets together to work out a plan to keep the child safe. In practice, extended family, friends and others often are left out, and the agency presents a “cookie cutter” service plan instead of something geared to what the family really needs. In other words, DHS does exactly what DHS would have done had there been no family team meeting. ● Although people interviewed by the consultants claimed that a wide array of services are available to families, as I read the consultants’ report, the services appear to be skewed heavily toward providing the kinds of help that make the helpers feel good – endless “counseling” and “parent education” instead of the help families need, which often involves concrete help with things like housing, child care and other supports to ameliorate the worst effects of poverty. 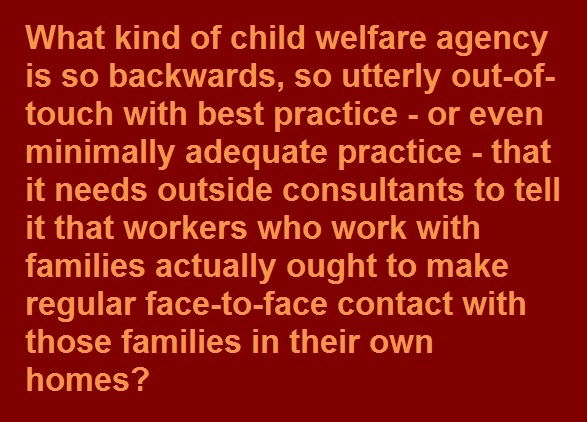 Indeed some of those consulted by the consultants said that the workers who are supposed to support families actually do little more than monitor them. Others said the people who do these jobs are not well-qualified to do much else. ● Both parents and children rarely saw their own lawyers at any time except at court hearings. The consultants were too polite to say that that means, so I will: It means neither parents nor children typically get anything approaching adequate legal representation. It means everyone has to rely on DHS’ version of the facts. And that means DHS almost always gets whatever it wants. Now, let’s stop and think about that last sentence for a moment. 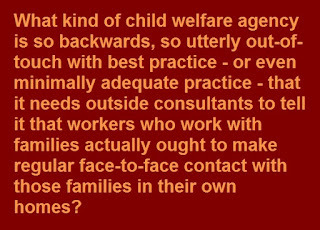 What kind of child welfare agency is so backwards, so utterly out-of-touch with best practice - or even minimally adequate practice - that it needs outside consultants to tell it that workers who work with families actually ought to make regular face-to-face contact with those families in their own homes? The one that has been destroying the lives of children in Iowa for decades.